Roller banners are an important tool for any business looking to stand out at an exhibition or any kind of trade show. They are also an exceptional tool in making an impact in your shop or place of business – eye catching, and easily manoeuvrable, they offer flexibility and make a great addition to point of sale material. Get the right banner designer for the job. At expert banner printers Printloft, many businesses across the UK have benefitted from our clean and easy banner printing service. We understand that banners of all sizes can prove to be strong marketing tools. As accomplished banner printers we provide banners across a variety of sizes including 540gsm PVC, 350gsm wind permeable mesh and a 850x200 roller banner. One of the main benefits of roller banners is their portability. Durable, easy to store, and simple to assemble, roller banners are perfectly suited to marketing on the move. Their longevity ensures that getting the right roller banner design can mean great value for money, with a huge return on investment. This is important to consider when consulting a banner designer. Maximise the natural longevity of roller banners when investing in banner printing. It is important not to include a time or date on your roller banner, to ensure you don’t give it a premature expiry date and limit its long term use. Our experience as a banner designer has shown us that it can be useful to answer key questions the consumer may have about your company, namely: ‘What’, ‘Why’ and ‘How’. Don’t forget that these answers should be concise and compelling! Useful basics to provide your banner designer with include a message about who you are, what you do, complete with your website and contact details. 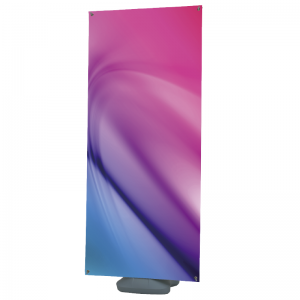 Banner printers should be furnished with your logo, and exactly what it is you want to put across to people. Make sure the main impact of your message is at eye level to the consumer, so that they don’t miss the point of the roller banner. At the same time, keep things simple. Printloft are experienced banner printers, and know that the most effective banner printing secret is ‘less is more’. If a consumer requires more information, they can always turn to your team members or other marketing tools such as leaflets and folded flyers. Including plenty of eye catching colour, and quality images in your banner printing design is also key to success with roller banners. These should be in keeping with your company’s theme or current logo choices to maximise the marketing value of your roller banner. Printloft have years of experience as a banner printers, and as such we are happy to answer any queries and questions you might have regarding banner printing, or indeed any of our other services such as leaflet printing.